Ok...I was wondering what to write for Valentine's Day. NOT another sappy, emotional, whining post. Actually, I think Valentine's Day was an idea dreamed up by the Devil himself to destroy every loving relationship through guilt. I mean....it's like this. When Jerry and I were "newlyweds", which means under 5 years.... I thought Valentine's Day was all about making me a princess. He needed to show me how much he loved me by bringing me flowers and taking me out to a fabulous restaurant ...wine and dine, so to speak. It was all about ME. Not that I was a princess or anything. I've always been a survivor and worked like a trojan horse. BUT, VALENTINE'S DAY! Come on! It was our first year of marriage and Jerry, I'm sure, did not even know what day is was...much less think of bringing me flowers. When he arrived after work to our little apartment and wondered what was for dinner, I knew I was in trouble. NO! I knew HE was in trouble. We fought like the dickens..."What!!!! You didn't bring me flowers? We're not going out for dinner? Nothing?" He got so mad that he stormed out the door! He left and went to his mother's house.....stripped her rose bushes naked...came back..and shoved them in my face! HERE! Oh, what a memory. Can any of you relate? After the emotional country music fiasco the other night, I decided I would brave it again...this time during the day. Jerry's activity directors planned a real Valentine's banquet complete with an arched entry way, ceiling full of balloons, and a jazz combo playing those "DADGUM" love songs. When I arrived, I saw an empty chair by Jerry. Everyone was dressed in red. The tables were covered in white table clothes, and the servers were all dressed up in red and black. They served wine (which was non-alcoholic) and prime rib with stuffed baked potatoes. They really went all out. I was happy to take that empty seat next to Jerry. It was the activity director's seat. She feeds Jerry. Sniff! Yes. He is to the point now, where he cannot feed himself. Even so, he liked his steak. He held my hand and it was truly romantic to be able to serve him in such a way. It makes me cry. ....because THIS is true love. To love and serve each other to the very end once all the superficial trappings have fallen off. To lighten up a bit.....I asked Jerry if he wanted to dance. It was the only word he said all day, "Yes." It was a beautiful word. Sorry, I teared up....but seriously....what a wonderful treasure we have been blessed with...to be here for each other. It's an unbelievable reward for a lifetime of being together. So....you youngins. THINK! There are no better riches than long lasting relationships that endure to the very end....Hang in there. In the Book of John, we see that Mary knelt at the feet of Jesus. That was an act that was filled with humility with a readiness to serve. Jesus didn't demand it. She recognized him and had an enduring love for him. It is the only way to truly live. To serve one another. 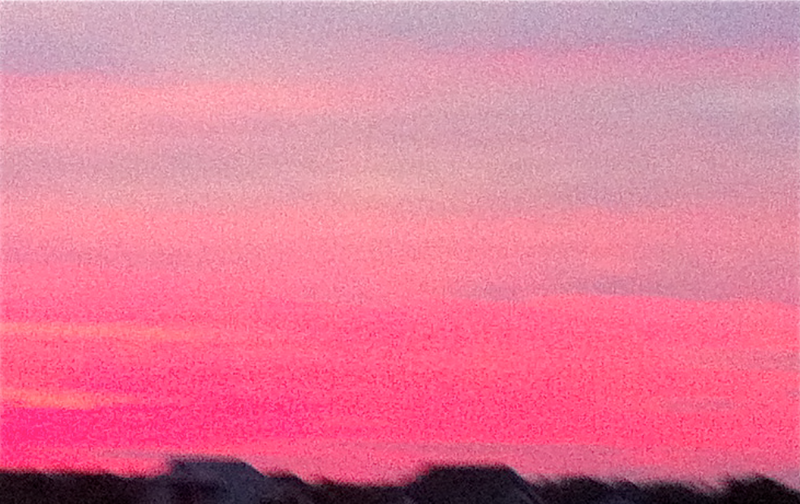 And,YES, this is actually the tonight's sunset..a Valentine's sunset..that appeared while I was writing this post. Have a happy Valentine's Day.